Known for its authentic Baja cuisine, Rockin' Baja Coastal Cantina is making a new name for itself. Recently, this San Diego staple has added a new element to its atmosphere at Old Town - sushi. A fire pit rests in the center of the patio, inviting guests to sip sake and savor sushi prepared Baja-style. An all-new sushi bar attracts the hippest San Diego crowd. Early or late, it's Hot Roc Sushi at Rockin' Baja. Once inside, you'll find contemporary - yet still Baja - décor that evokes the energy Rockin' Baja is known for. The sushi lounge boasts its own style and the menu is centered on fresh Baja seafood. Another perk? Hot Roc Sushi offers an incredibly hip, fun atmosphere without the cost of high-end sushi venues. The creative take on sushi is as tempting as it is tasty. Each sushi roll is artfully prepared on stark white plates, putting the center and focus on the food. The menu offers a traditional sushi experience ... with a twist. The concept was developed by founder Rick DiRienzo's love for fresh, quality seafood. "Baja, Mexico is known for so many amazing varieties of fish, as well as their fresh produce. I wanted to pair those flavors and give traditional sushi a bit of a twist. All of our sushi offerings are uniquely flavorful, with just the right amount of 'Baja' infusion," noted DiRienzo. The flavor fusion ranges from sweet to spicy and does not disappoint. Selections include the K-38, a vegetarian roll that includes roasted red peppers, sliced mango, sautéed shiitake mushrooms, chopped cashews, sweet chile sauce and mango sauce; the Crunchy Eskimo Roll, a mix of spicy king crab, crunchy tempura bits and en fuego sauce; the Tortuga Roll, a roll bursting with the flavors of ahi tuna, avocado slices, cream cheese and sweet chile sauce; and the Mexican Yard Sale, made with salmon, mango salsa, cream cheese, crunchy tempura bits, sweet chile sauce and mango sauce. Some highlights of the starters menu are Rail Bangers, a baked mix of jalapenos tempura, spicy crab, en fuego sauce and yaki sauce; and Roasted Garlic Edamame, edamame mixed with garlic soy ginger sauce. 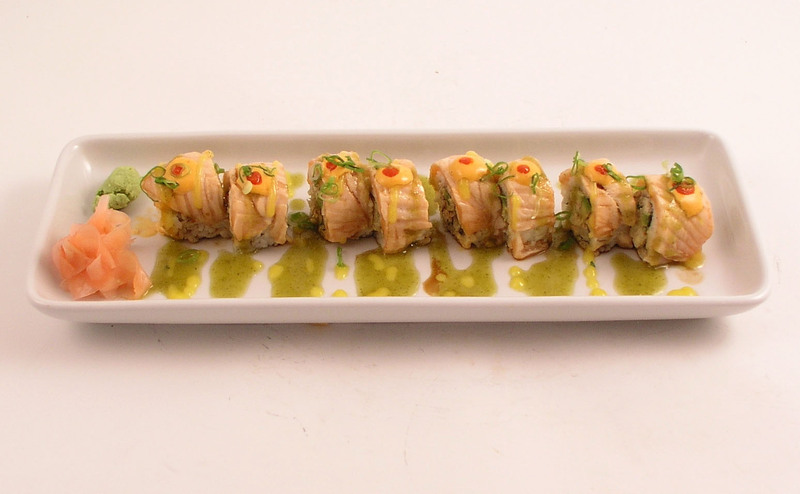 Or try a sushi roll as an appetizer and pair it with one of Rockin' Baja's famous Baja Buckets for dinner. Hot Roc Sushi is available Sunday through Thursday from 5 to 11 p.m. and Friday and Saturday from 5 p.m. to midnight. To view the sushi menu, please visit http://www.rockinbaja.com or join us at Rockin' Baja Old Town at 3890 Twiggs Street. Inspired by the flavors and the coastal tranquility of Puerto Nuevo, a small fishing village in Baja California, Mexico, Rick DiRienzo introduced a new taste for lobster to the legions of lobster lovers in San Diego, CA. As a family-owned and operated business, Rockin' Baja Lobster opened its doors in 1983 and continues to ensure that their family feel is present in each of the five locations throughout Southern California. The restaurant features a fresh selection of seafood in addition to tender chicken, steak, burgers and more. Rockin' Baja Lobster prides itself in offering a rockin' good time with truly delicious and unique dining experiences with every visit. Please visit Rockin Baja Coastal Cantina at http://www.rockinbaja.com.